For the first time since arriving in Cleveland four years ago, Love is expected to play the role of Cavaliers’ floor general — a position previously filled by a certain someone named LeBron James. Now that the megastar has taken his scoring and leadership skills to the Los Angeles Lakers, Love will begin his 11th season as the Cavs No. 1 option on offense and a senior voice in the locker room. “I think everybody has their own process as a leader, and I think for me it’s ever-evolving,” Love told CNN Sport earlier this month in a telephone interview. But this experience will be vastly different from his first go-around as a team leader with the Minnesota Timberwolves, who failed to make the playoffs in Love’s first six NBA seasons. “We didn’t have that veteran, or guys who we could really look up to and learn from, whether it be on or off the floor,” the says the 6-foot 10-inch forward of his time in Minnesota, where he averaged 26 points and 12.5 rebounds in his final season. Arriving in Cleveland at the behest of James, Love played on four finals teams in four years — including the 2016 squad that brought the first championship to Cleveland in 52 years — while watching one of the greatest motivators in team sports lead by example. “All four years in Cleveland, we were expected to win the championship,” he says. “We had a personality who was a huge leader in LeBron James, who brought it every single day, who put his time in, and was very vocal, and continued to grow in his sense as a leader. One more trait inherited from James was his willingness to reach out to teammates privately during the offseason to form personal relationships. 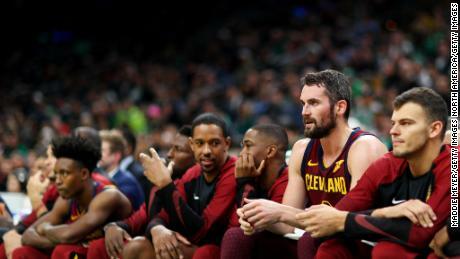 James is famous for including current and former teammates like bestie Dwayne Wade in his offseason workouts, but the veteran privately reached out to Love after their first season together in Cleveland. It was a transitional year for the former UCLA man, who went from first scoring option in Minnesota to third wheel behind James and Kyrie Irving in Cleveland. Out of contract, Love was reportedly unsure of whether to stay in Cleveland or look to return to the West Coast.